The new President of Sierra Leone, Julius Maada Bio, has appealed for international help to deal with the debt crisis he says he has inherited from the previous government. Speaking at an IMF meeting in Freetown in April, President Bio said “With the signing of new agreements on the eve of the elections, Sierra Leone is already in a debt crisis, which in collaboration with our development partners we must urgently address”. Sierra Leone agreed new loans from the IMF of $220 million in June 2017. At the time the loans were agreed, the IMF expected external government debt payments to be 11% of revenue in 2018, but said they could reach 15% if there is one economic shock. In that review, Sierra Leone’s external debt was said to have more than doubled from 21% of GDP in 2013 to 46% in 2017, five years in which the country’s people were bit by the Ebola outbreak. In the IMF 2017 debt assessment they predicted that GDP growth would be 6% in 2017, though in a worst case scenario it would be 4.3%. The IMF’s World Economic Outlook (WEO) now says it was worse than the worst case scenario, 3.5%, and will be 3.5% again in 2018. The IMF 2017 assessment said total government debt (including domestic debt) would reach 61% in 2018 and 62% in 2020. The WEO now says it will be 64% in 2018 and 74% by 2020. The IMF has once again been wildly over-optimistic in its assessments. 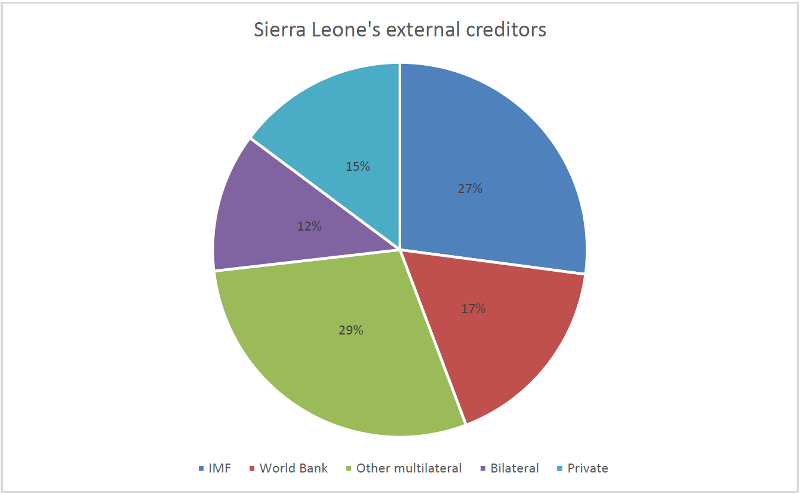 From World Bank and IMF data, 27% of Sierra Leone’s debt is owed to the IMF, with a further 17% owed to the World Bank and 29% other multilateral institutions. In total, 73% of the debt is therefore owed to multilateral institutions. 15% is owed to private creditors and 12% other governments. In 2015, the IMF cancelled $100 million of debt payments by Sierra Leone, Liberia and Guinea, following the Ebola outbreak. However, at the same time, they gave $160 million of new loans. Jubilee Debt Campaign warned at the time that this was helping Sierra Leone’s finances in 2015 and 2016, but would leave the country struggling to make high debt payments in subsequent years.